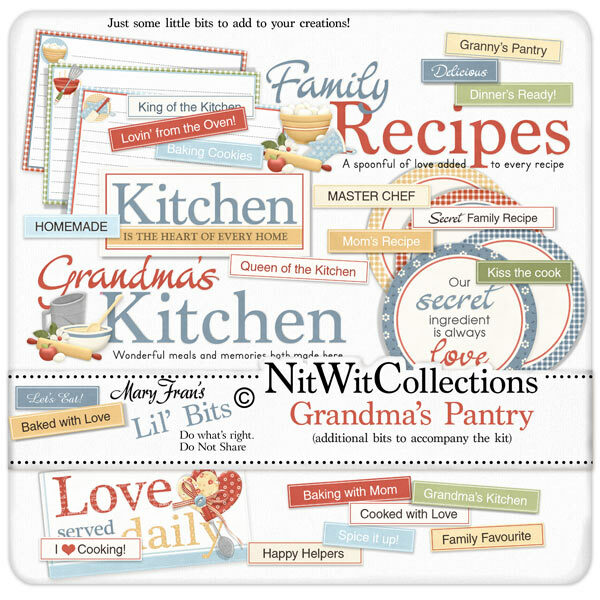 Lil' Bits "Grandma's Pantry" has many more "ingredients" to assist you in creating your layouts and cards. There are all sorts of premade items, (kind of like buying the buns rather than baking them yourself) so please don't miss these. These digital elements are NOT included in the FQB "Grandma's Pantry" Collection. 1 Label - "Our secret ingredient...."
1 Wordart - "Family Recipes...."
1 Wordart - "Grandma's Kitchen"
1 Wordart - "Kitchen is the....."
1 Wordart - "Love served daily"